Dr. Mark Gilbert in his office at Camp Hill Veterans Memorial Building. (Photo: Kenneth Conrad). Dr. Mark Gilbert has experienced first-hand the healing power of art in end-of-life care. 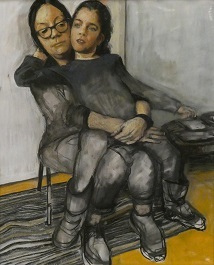 The researcher and artist recalls his father Norman, an artist himself, painting portraits of his wife Pat (Gilbert’s mother), after she had been diagnosed with Alzheimer’s disease. Pat later suffered a massive stroke from which she would not recover. Dr. Gilbert says he was “staggered” to discover that as his father kept vigil during what would be the last week of her life, he had brought his sketchbook to the hospital to continue drawing her. 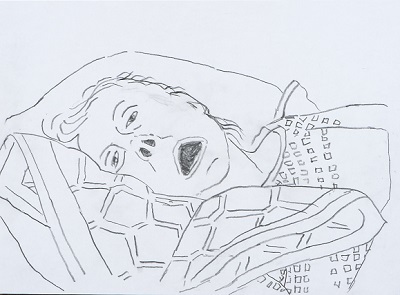 Based out of the Memory Clinic at the Camp Hill Veterans Memorial Building, Dr. Gilbert is continuing the work that previous artists have performed alongside Dr. Kenneth Rockwood of Dalhousie’s Division of Geriatric Medicine in using portraiture to explore the experiences of people living with dementia and their partners in care. Consenting participants are introduced to Dr. Gilbert, who meets with them and begins the process of the portrait, while also collecting data for his shared qualitative research project with Dr. Rockwood. Mark Gilbert, Brian and Lindsay, Pastel on paper, 2018. (Provided photo). The ongoing research study explores the relationships and interactions of patients and their partners in care attending the Memory Clinic. Dr. Gilbert is giving a presentation at the Art Gallery of Nova Scotia on Thursday, January 31 called Art & Dementia: The Paradox of Vulnerability, in which he’ll share stories from his more than 20 years of working with patients, physicians and caregivers on arts-based research projects in hospitals in North America and Europe. “The theme of the talk is vulnerability,” says the native of Glasgow, Scotland. “The silence that occurs when working together can be seen as a vulnerable thing, but on the whole, the silence that happens is one of comfort. We actually know from previous studies that it can generate powerful reflective processes that can be potentially beneficial and can potentially be regarded as healing. Aside from his role at the hospital, Dr. Gilbert is a post-doctoral fellow in the Medical Humanities-HEALS program at Dalhousie Medical School. He’s worked with the program’s director, Dr. Wendy Stewart, to incorporate the humanities into the medical school curriculum. He describes working with young patients of Dr. Stewart’s with severe epilepsy, and their partners in care. The resulting artworks from that study were exhibited in Saint John, N.B. last year. Mark Gilbert, Erin and Michaela, Pastel on paper, 2018. (Provided photo). Dr. Gilbert envisions such art exhibitions as a way of engaging both the public and medical students. While not a medical doctor (he earned a PhD in 2014 in the Medical Sciences Interdepartmental Area program at the University of Nebraska Medical Center), Dr. Gilbert is cognizant of the personal growth he’s experienced through his collaborations with patients, physicians and caregivers.